Artillery was used by the English army as early as the Battle of Crécy in 1346, while Henry VIII established it as a semi-permanent function in the 16th century. Until the early 18th century, the majority of British regiments were raised for specific campaigns and disbanded on completion. An exception were gunners based at the Tower of London, Portsmouth and other forts around Britain, who were controlled by the Ordnance Office and provided personnel for field artillery 'traynes' as needed. Their numbers were extremely small; as late as 1720, the total establishment for the whole of Britain was 41 master gunners and 178 gunner assistants. During the 18th century, the military became increasingly professional, particularly in the fields of artillery and engineering; Britain lagged behind others in this area, with Vauban establishing the French Corps royal des ingénieurs militaires as far back as 1690. When Marlborough was restored as Master-General of the Ordnance in 1714, he initiated a series of reforms, which included splitting the existing Ordnance Service into artillery and sappers or engineers. This was approved and two permanent companies of field artillery were established in 1716, each 100 men strong; this became the "Royal Artillery" in 1720. These were increased to four companies and on 1 April 1722 grouped with independent artillery units at Gibraltar and Menorca to form the Royal Regiment of Artillery; the first commander was Colonel Albert Borgard, a Dane who served in the British army since 1698. Selection and promotion within the Royal Artillery was largely based on merit, rather than the commission purchase system used elsewhere until 1870. A cadet company was formed at the Royal Military Academy or RMA Woolwich in 1741; this trained artillery and engineering officers for the regiment, the East India Company and the Royal Irish Artillery. In 1757, it split into two battalions, each of twelve companies; by 1780, it contained 32 companies in four battalions, two "invalid companies" used solely for garrison duties and the Royal Artillery Band, with a total strength of 5,241 men and officers. Originally based in the Royal Arsenal, beginning in 1770 the regiment was rehoused in the Royal Artillery Barracks on Woolwich Common. A major innovation in 1793 was the establishment of the Royal Horse Artillery, designed to provide mobile fire support for cavalry units. The regiment was involved in all major campaigns of the Napoleonic Wars; in 1804, naval artillery was transferred to the Royal Marine Artillery, while the Royal Irish Artillery lost its separate status in 1810 after the 1800 Union. This period also saw development of the Congreve rocket; based on an existing Indian design, these were the first solid-fuel projectiles used by the British army and two Rocket troops were established in 1814. Their use in the War of 1812 is referenced in the line 'rockets red glare' which appears in the Star-Spangled Banner. After Waterloo in 1815, Europe was at peace until the 1853 Crimean War. Overall supervision of the regiment was transferred to the War Office when the Board of Ordnance was abolished in 1855 and the War Office School of Gunnery established in Shoeburyness in 1859. When the British East India Company was dissolved in 1862, its artillery function was absorbed by the Royal artillery, giving it a total strength of 29 horse batteries, 73 field batteries and 88 heavy batteries. Military expenditure estimates for 1872 list the regimental strength as a total of 34,943 men and officers, including those in India. On 1 July 1899, the Royal Artillery was divided into three groups: the Royal Horse Artillery of 21 batteries and the Royal Field Artillery of 95 batteries composed one group, while the coastal defence, mountain, siege and heavy batteries were split off into another group named the Royal Garrison Artillery of 91 companies. The third group continued to be titled simply Royal Artillery, and was responsible for ammunition storage and supply. Which branch a gunner belonged to was indicated by metal shoulder titles (R.A., R.F.A., R.H.A., or R.G.A.). The RFA and RHA also dressed as mounted men, whereas the RGA dressed like foot soldiers. In 1920 the rank of Bombardier was instituted in the Royal Artillery. The three sections effectively functioned as separate corps. This arrangement lasted until 1924, when the three amalgamated once more to become one regiment. In 1938, RA Brigades were renamed Regiments. During the World War II there were over 1 million men serving in 960 gunner regiments. In 1947 the Riding House Troop RHA was renamed The King's Troop RHA and, in 1951, the title of the regiment's colonel-in-chief became Captain General. When The Queen first visited the Troop after her accession, it was expected that it would become "The Queen's Troop", but Her Majesty announced that in honour of her father's decision it would remain "The King's Troop". BL 8-inch Howitzer Mk 1 – 5 8 in (200 mm) howitzers of the 39th Siege Battery, Royal Garrison Artillery, in action near Fricourt in World War I. The Royal Horse Artillery, which has separate traditions, uniforms and insignia, still retains a distinct identity within the regiment. Before World War II, Royal Artillery recruits were required to be at least 5 feet 4 inches (1.63 m) tall. Men in mechanised units had to be at least 5 feet 8 inches (1.73 m) tall. They initially enlisted for six years with the colours and a further six years with the reserve or four years and eight years. They trained at the Royal Artillery Depot in Woolwich. From its beginnings, the Royal Artillery has been based at Woolwich, in south-east London. In 2003 it was decided to move the headquarters to Larkhill on Salisbury Plain in Wiltshire (the RA's training ground, where the Royal School of Artillery has been based since 1915). The last Royal Artillery troops left Woolwich Barracks in 2007; in 2012, however, the King's Troop, Royal Horse Artillery was relocated to Woolwich from their former headquarters in St John's Wood. The Captain General of the regiment is Queen Elizabeth II. The post was previously known as Colonel-in-Chief until King George VI expressed the desire to be known as Captain General. The head of the regiment is the Master Gunner, St. James's Park. The Royal Regiment of Artillery comprises both Regular (full-time) and Reserve (part-time) units. The Royal Regiment of Artillery is unusual in that it has sub-units that often move between regiments, or are placed into suspended animation. See List of Royal Artillery Batteries. The Royal Regiment of Artillery comprises 13 Regular Army Regiments and are designated by a number and the name Royal Artillery (RA) or Royal Horse Artillery (RHA). Historically these names reflected the role the units performed, but in the modern era are retained purely for historical reasons. The King's Troop, Royal Horse Artillery – a ceremonial unit equipped with 13 pounder guns for firing salutes. Now located in Woolwich Garrison, London. 1st Regiment Royal Horse Artillery – equipped with AS90 self-propelled artillery and MLRS at Assaye Barracks in Tidworth. The Regiment will move to Larkhill barracks by 2020. 3rd Regiment Royal Horse Artillery – (The Liverpool and Manchester Gunners) are equipped with L118 105mm light gun based at Albemarle Barracks outside Newcastle-Upon-Tyne. 7th Parachute Regiment Royal Horse Artillery – (The Airborne Gunners) are equipped with L118 105mm light gun and are currently part of 16th Air Assault Brigade based in Colchester. 4th Regiment Royal Artillery – (The North East Gunners) are equipped with L118 105mm light gun at Alanbrooke Barracks in Topcliffe. 5th Regiment Royal Artillery – (The North, East & West Yorkshire Gunners) are equipped with Surveillance and Target Acquisition assets and are based at Marne Barracks in Catterick, North Yorkshire. The Regiment will move to Larkhill barracks in 2018/19. 12 Regiment Royal Artillery – (The Lancashire and Cumbrian Gunners) are an air defence unit equipped with Starstreak HVM and are based at Baker Barracks, Thorney Island. 14 Regiment Royal Artillery – are the Training and Support Regiment based at Stirling Barracks in Larkhill. 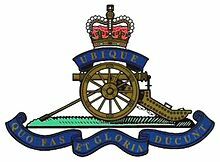 16 Regiment Royal Artillery – (The London and Kent Gunners) are an air defence unit equipped with Rapier and are based at Baker Barracks, Thorney Island. 19 Regiment Royal Artillery – (The Highland Gunners) are equipped with AS90 self-propelled artillery and MLRS at Assaye Barracks in Tidworth. They are expected to move to Larkhill Barracks by 2020. 26 Regiment Royal Artillery –– (The West Midland Gunners) are equipped with AS90 self-propelled artillery and MLRS at Mansergh Barracks, Guttersloh, Germany. They are expected to move to Larkhill barracks as a dedicated MLRS Regiment by 2021. 29 Commando Regiment Royal Artillery – (The Commando Gunners) are equipped with the L118 105mm light gun, and are currently part of 3 Commando Brigade. Most batteries are currently based at the Royal Citadel in Plymouth, with one battery (148 (Meiktila) Battery) based at RM Poole and 7 (Sphinx) Battery based at Royal Marines Base Condor in Arbroath. 32 Regiment Royal Artillery – (The Wessex Gunners) are equipped with Unmanned Air Vehicles and are based in Roberts Barracks in Larkhill. The regiment will disband with personnel redistributed to other parts of the British Army in 2021. 47 Regiment Royal Artillery – (The Hampshire and Sussex Gunners) – are equipped with the Thales Watchkeeper WK450 and are based in Horne Barracks in Larkhill. 105 Regiment Royal Artillery 'The Scottish & Ulster Gunners' are equipped with the L118 light gun. 106 (Yeomanry) Regiment Royal Artillery: Air defence. Rapier FSC – Rapier is a Short Range Air Defence weapon (SHORAD) that is operated by 16th Regiment. Starstreak HVM – Starstreak HVM is a Very Short Range Air Defence (VSHORAD) system that is a continuation of the Blowpipe and Javelin series. It is operated as either a shoulder-launched weapon, in the Lightweight Multiple Launcher mode or mounted on the Alvis Stormer armoured vehicle. The weapon is operated by 12th Regiment and 106 Regiment RA. MLRS – the Multiple Launch Rocket System provides a precision fire capability out to a range of 85 km. In 2014 the dedicated 39th Regiment RA was disbanded and today the system is integrated into 1st Regiment RHA, 19th Regiment RA and 26th Regiment RA. 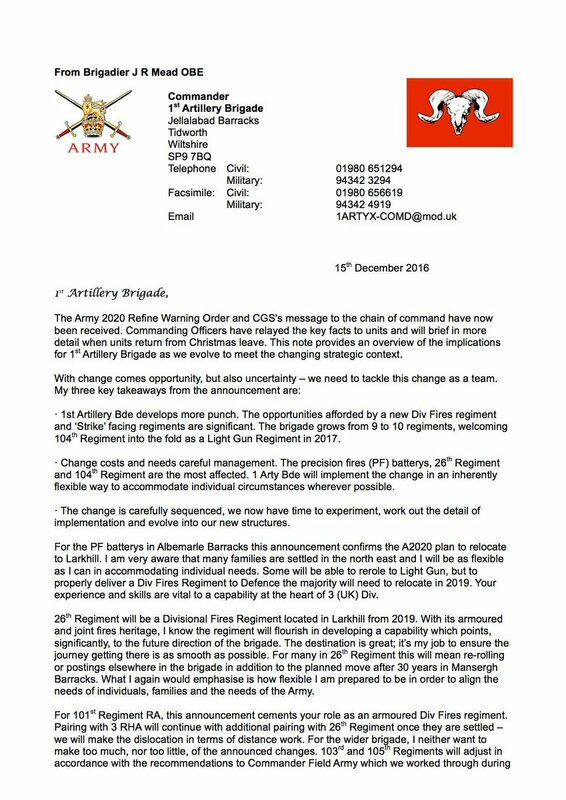 In the future 26th Regiment will take on a dedicated precision fires role and the system will be withdrawn from 19th Regiment RA and 1st Regiment RHA. AS-90 – the AS-90 is a 155mm self-propelled gun and is utilised by 1st Regiment RHA, 19th Regiment RA and 26th Regiment RA. L118 light gun – the Light Gun is a 105 mm gun. It is operated by 3rd Regiment RHA, 4th Regiment RA, 7th (Para) Regiment RHA, 29 (Commando) Regt RA, as well as three Army Reserve regiments – 103 Regt RA, 104 Regt RA and 105 Regt RA. Exactor (Spike NLOS) – a vehicle-mounted high-precision guided missile. It is currently operated by 1st RHA, 19 RA and 26 RA, with the capability passing solely to 26 RA by 2020. MAMBA (Mobile Artillery Monitoring Battlefield Array) uses radar to track enemy mortar and artillery shells out to a range of 40 km. It can be used to predict the point of impact, thereby giving a number of seconds warning, but is usually deployed to trace the point of origin of mortar/artillery rounds and then provide correction for counter-battery fire. It is operated by 5th Regiment RA. ASP (Advanced Sound-ranging Program) is an acoustic triangulation system that used a series of sensor posts (microphones) to triangulate the point of origin and point of impact of enemy mortars and artillery. It is also operated by 5th Regiment RA along with 101st (Northumbrian) Regiment Royal Artillery. BASE ISTAR - 5th Regiment RA also operates a number of telescopic camera systems that are designed to provide surveillance and target acquisition in static locations. Thales Watchkeeper WK450 (UAV) is operated by 47th Regiment Royal Artillery. Desert Hawk III UAV – the DH3 is a hand-launched UAV. It is operated by 32nd Regiment and will be withdrawn from service from 2021. Gunners of the 78th Field Regiment, Royal Artillery make use of two sunshades from a cafe to keep the rain off while making a brew, Anzio, Italy, 27 February 1944. In the British Army Order of Precedence, the Household Cavalry is always listed first and always parades at the extreme right of the line. However, when the Royal Horse Artillery is on parade with its guns, (usually in the form of The Kings Troop, Royal Horse Artillery) it will replace the Household Cavalry at the extreme right of the line. The Regimental museum, "Firepower" located in the Royal Arsenal at Woolwich closed in 2017. It is expected to relocate to Larkhill. ^ "No. 18952". The London Gazette. 10 July 1832. p. 1583. ^ cgsmediacomma-amc-dig-shared@mod.uk, The British Army,. "The British Army - Regiments". www.army.mod.uk. Retrieved 3 March 2017. ^ Chandler David, Beckett Ian (1996). The Oxford History Of The British Army (2002 ed.). Oxford University Press. p. 52. ISBN 978-0-19-280311-5. ^ Hogg, Brigadier O.F.G. (1963). The Royal Arsenal. Oxford University Press. pp. 302–344. ^ Duncan, Francis (1872). History of the Royal Regiment of Artillery: Volume I (1879 ed.). John Murray. p. 435. ^ Latcham, Paul. "Armstrong, John". Oxford DNB. Retrieved 26 March 2019. ^ Journals of the House of Commons, Volume 37; November 1778 to August 1780. HMSO. 1803. p. 487. ^ Saint, Andrew, Guillery, Peter (2012). Survey of London; Woolwich Volume 48 (PDF). Yale University Press. pp. 26–28. ISBN 978-0300187229. ^ Stearn, Roger (2008). Congreve, Sir William, second baronet. Oxford DNB Online. ^ Duncan, Francis (1872). History of the Royal Regiment of Artillery: Volume I (1879 ed.). John Murray. p. 2. ^ "King's Troop: A modern history of 1945 to 2012". Ham & High. Retrieved 13 October 2015. ^ "Strategic Defence and Security Review - Army:Written statement - HCWS367 - UK Parliament". Parliament.uk. 4 December 2014. Retrieved 16 December 2016. ^ "In Search of Exactor". Think Defence. 7 April 2014. Retrieved 23 January 2016. Graham, C A L (1939). The Story of the Royal Regiment of Artillery. RA Institution, Woolwich. Wikimedia Commons has media related to Royal Artillery.